How does it begin? 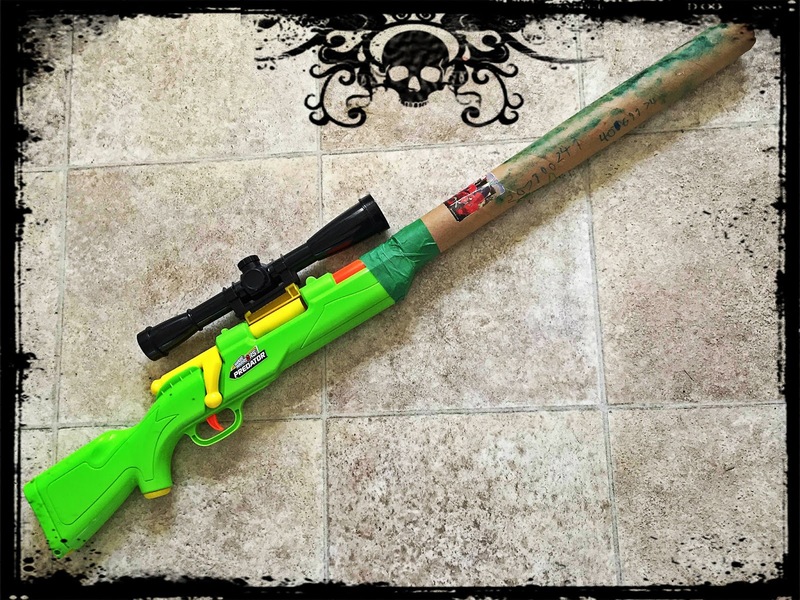 Whether as a relative's passive aggressive attempt to annoy me or a birthday party gift picked out by a classmate, toy guns have made their way, unbidden, into my household. I have tried to avoid exposing my son to violence: I don't own a television or a video game console; I only approve gun-free games for play on my son's sweet retro GameBoy Color; and I have surreptitiously set the parental controls on his tablet to "E for everyone" games only. I've finally given up on "misplacing" the brightly-coloured rifles and pistols that he brings home and I am instead focusing my attention on trying to raise his awareness of the harm that guns do. If you have a tiny gun nut living in your home, these children's graphic novels might help pave the way to a more critical perspective on guns and gun violence or, at least, provide a (gun-free) adventure alternative. 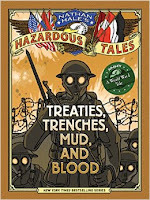 When my son developed an interest in World War I and World War II, we were making our way through the Nathan Hale's Hazardous Tales series. Treaties, Trenches, Mud, and Blood was an excellent and surprisingly accessible introduction to this complex subject. The storyteller is the author's namesake, Nathan Hale, a soldier and spy who served with the Continental Army during the American Revolutionary War. (Hale, the historical figure, tells his own tale in the first of the series, One Dead Spy). In each book, Hale delays his own execution by regaling his audience (composed of his rather thick but animal-loving executioner and a gruff British military officer) with exciting stories of future events. Younger readers will appreciate the comic-relief provided by the hangman as well as Hale's efforts to explain politics and historical events in relatively simple terms. No romanticizing here although it's difficult to say whether the book succeeded in conveying something like the scale of death and destruction of the Great War to my sheltered Canadian 6-year-old. Sheila Keenan's The Dogs of War tells three war stories - from the first and second World Wars and from the Vietnam War - with three dogs (and their handlers) as central characters. We learn about how dogs played important roles in each conflict, not least in their relationships with their human comrades-in-arms. Not surprisingly there is violence in these accounts, though not what I would call the gratuitous kind. The reader will also see moments when soldiers were afraid to fire their guns or held their fire out of compassion for the "enemy". In the last story, we also learn about what can happen when soldiers leave the battlefield in body if not in mind. 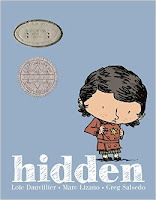 I had avoided Hidden: a child's story of the Holocaust, not because I didn't think my son shouldn't be exposed to such a heavy subject (yet) but because I wasn't confident I could get through the book without sobbing. As it happens, Loïc Dauvillier's choice to adopt a child's point of view offers readers a somewhat gentle but somber portrait of one Jewish girl's experience during the Holocaust. If you or your child have already read the Bone series by Jeff Smith, then you know that it's possible to find thrilling adventures for children that are entirely absent of guns, bombs, and related weaponry. If you haven't read (or reread) the series yet, you should. You really, really should. Both younger and older kids (and adults), will enjoy the Avatar, the Last Airbender series which features tribes of "benders" who use the four elements - Water! Earth! Fire! Air! (+ metal) - to engage in and resolve conflicts. The episodes are written around wholesome themes like ethics and friendship and (unlike the awful feature film version by M. Night Shyamalan) are inspired by Asian and Inuit culture. Best of luck on deprogramming your child in a society that glorifies gun violence! If all else fails, pass out Super Soakers instead.